Step up to this cute little café counter to enjoy Starbucks coffee and tea. 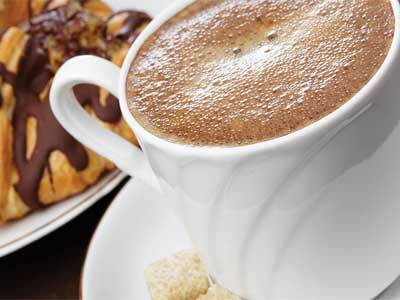 A large variety of specialty drinks are offered, from Chai to espresso, and hot chocolate to other kid favorites. There is small selection of delicious pastries that are sure to tempt you and a few sandwiches as well. Grab a bottle of water or juice from the chiller if you are more inclined to that than caffeine! This café is convenient to the conference center which makes it easy to grab a quick pick-me-up when attending a business meeting! Stop in today to grab a warm cup for a quick refreshment.